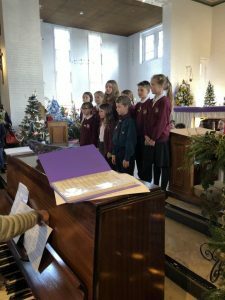 Music plays a huge part in school life and leading up to Christmas was no exception. Our school choirs took part in 8 events and excelled themselves at every one! On 25th November, we sang at the school Christmas Fayre which helped us get into a festive mood – early! On Saturday 9th December, we performed in Welwyn Garden City at the St Francis Church Christmas Tree Festival. The atmosphere was amazing, and we loved singing surrounded by Christmas trees. Our Community Choir also performed in the afternoon as the sun was setting. Next came the Monks Walk Community Concert at St John’s Church, Monks Rise. We enjoyed performing our pieces to a packed church, and singing a collaborative song with other schools in the area. 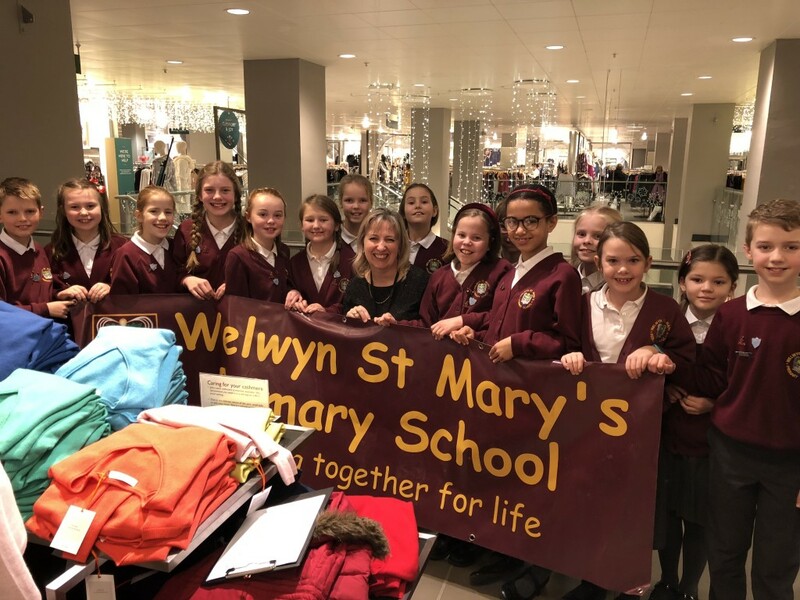 The chamber choir sang carols and seasonal pieces in John Lewis on Thursday 14th December – they thoroughly enjoyed the rapturous applause from shoppers – and the fact that they had an hour off school in the afternoon! A highlight of our Autumn Term performances is taking part in the Year 5/6 Carol Service at St Mary’s Church. The service always has a reflective atmosphere as it begins in candlelight with a soloist singing the first verse of ‘Once in Royal David’s City’ from the back of the church – Tilly sang beautifully. The highlight was an arrangement of ‘What Child is this?’ by John Rutter, sang by the Chamber Choir, with a soaring descant from Matthew and Ellie, who were singing from a different part of the church. Their ethereal voices were magical. The choirs sang at the Welwyn Garden City Male Voice Choir Charity Concert on 16th December. We sang a couple of carols together with them as well as performing by ourselves. This invitation came about, when their director heard us earlier in the year, performing at the Welwyn Festival. On Monday 18th December, our 3 choirs performed in their bi-annual Charity Concert at St Mary’s Church. We started with mulled wine and mince pies in New Church House and then we sang for an hour, interspersed with seasonal readings from Lucy and Mr Anstey, finishing with a rousing rendition (with audience participation) of The Twelve Days of Christmas. We were delighted that we were able to donate money to church, school and our two chosen charities: Samaritans Ware and the Rutland Ward, at Rutland Memorial Hospital. More charity work came on Saturday 23rd December when Mrs Harrison invited musicians to sing for Save the Children, in the Howard Centre in Welwyn Garden City. £781 was collected during the 2 hours that the choir was singing!